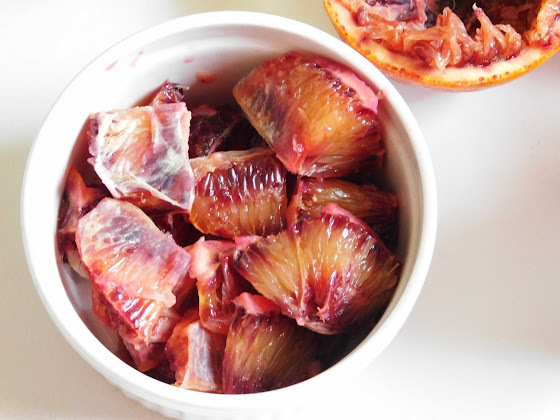 All winter long I’ve been basking in the wonderful taste and nutritional value of the striking blood oranges. And even though spring is well upon us, I’ve been lucky enough to still get my hands on them at the grocery store. Now, the real magic happens when you marry blood oranges with yogurt and chia seeds to create an exceptional and lip-smacking treat that you’ll crave every morning. Yes, we’re talking breakfast and the best part about this breakfast is that this Blood Orange Chia Pudding is a no-cook silky pudding that you whip up the night before. 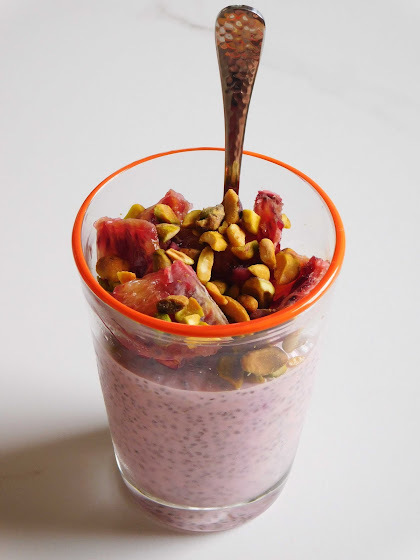 People have been going gaga over chia seeds for a long while now and I have been on the chia bandwagon myself. 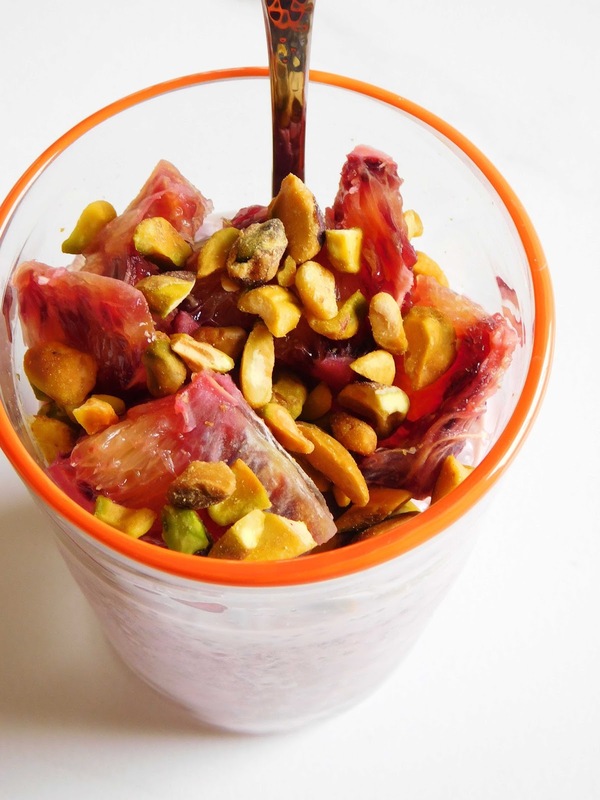 Truth is, with all the nutritional benefits of fiber and omega-3s that they pack they are hard to ignore. 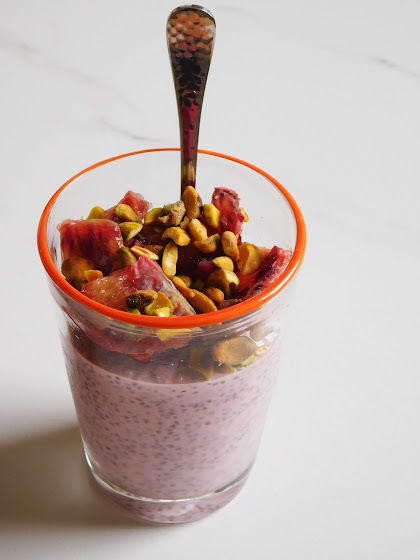 Plus, once drowned in the velvety blood orange juice and yogurt mixture, these chia seeds plump up and turn into tiny fat bubbles that burst onto your tongue and crack under your teeth. 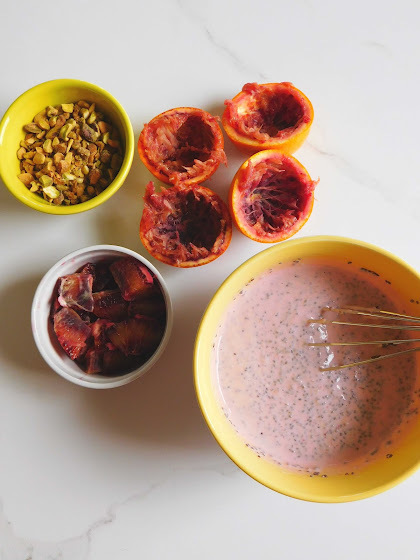 As Giada de Laurentiis noted in her cookbook, they do remind you of tapioca pearls, which I happen to adore, but even if you’re not a tapioca fan, this Blood Orange Chia Pudding will convert you into a chia lover in no time. 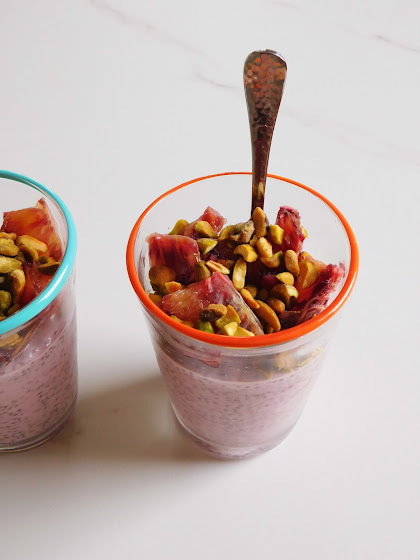 Although it might look like one while sporting a beautiful pale pink hue, this pudding is more than just a flavored, textured yogurt. 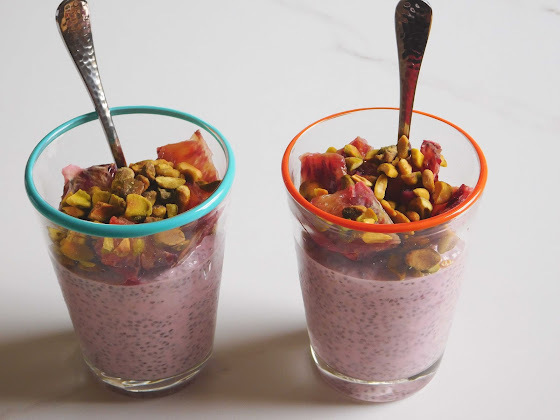 It is a smooth, pleasantly thick, creamy, tangy, citrusy and sweet pudding with a lovely somewhat bubbly texture that provides a substantial and filling breakfast in a tiny serving. 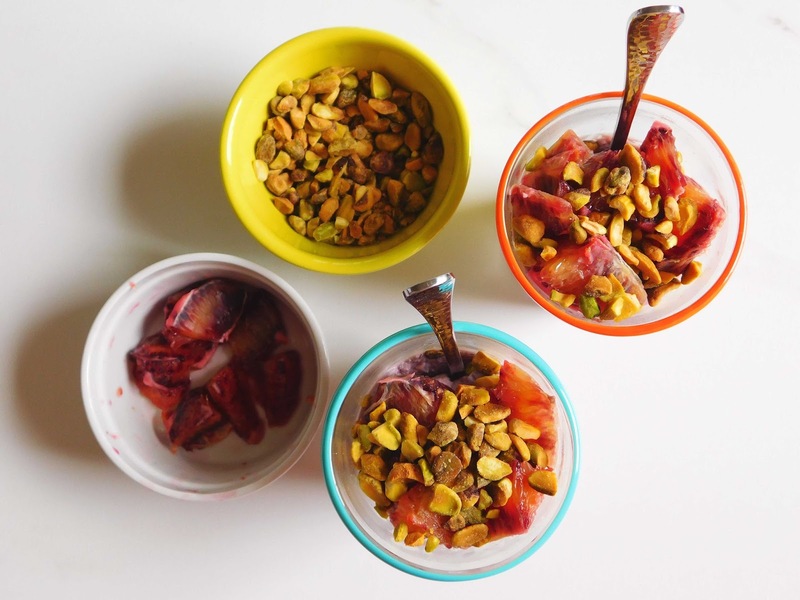 Top it with bright fruit and toasted pistachios and you’ve created the breakfast of champions. In addition, this Chia Pudding is quite versatile. 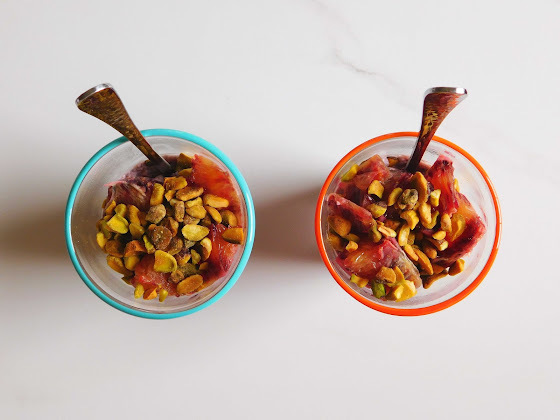 While I love the blood orange version, Giada offers a recipe that calls for vanilla-flavored unsweetened almond milk instead of orange juice. So, you can definitely replace the blood orange juice with almond milk and still end up with a phenomenal and slightly creamier concoction. Enjoy! In a medium bowl, whisk together the yogurt, blood orange juice, honey, vanilla and salt. 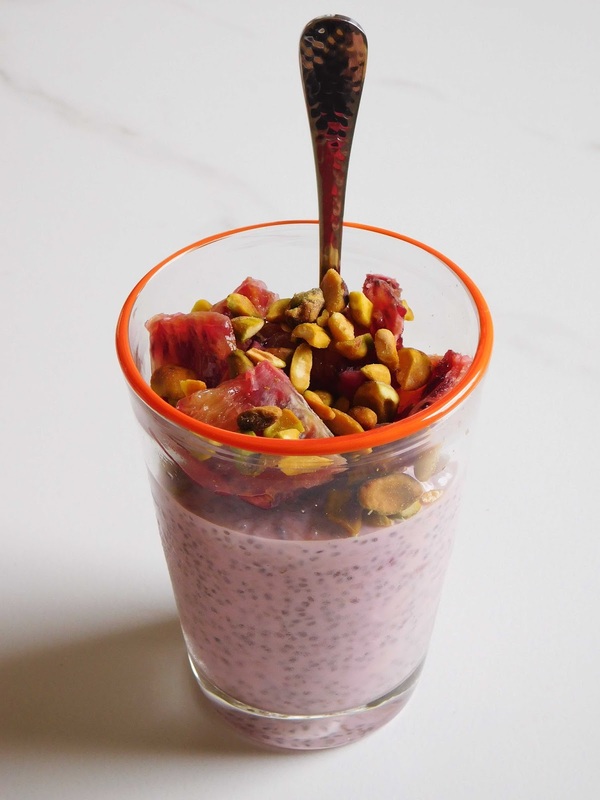 Whisk in the chia seeds. 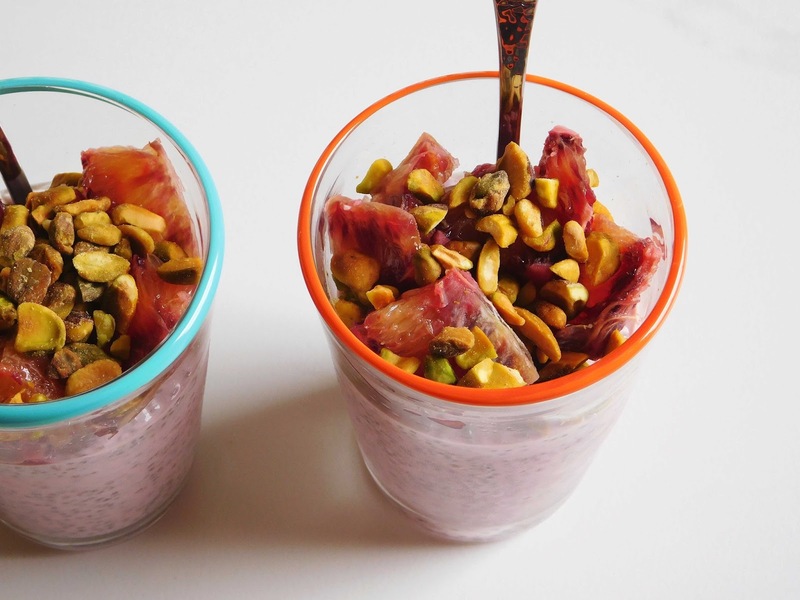 Cover the bowl with plastic wrap and chill for 8 to 24 hours. When you’re ready to eat the pudding, stir the pudding and divide it between small bowls or glasses. I, however, recommend that you divide the mixture between small bowls and glasses, cover them with plastic wrap and then chill for up to 24 hours. That way, come morning, I only have to grab one of the glasses from the fridge, stir, top the pudding with fruit and nuts and enjoy. 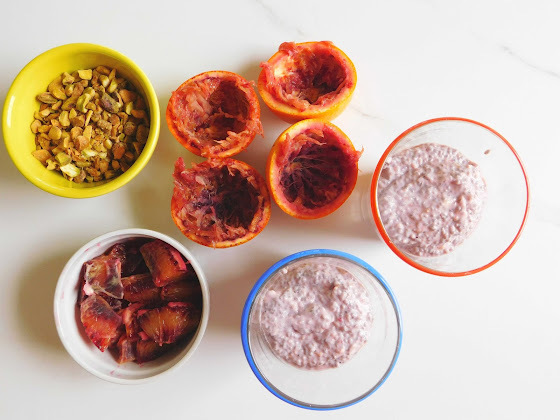 Before serving, layer the pudding with some orange segments (or other fruit you prefer). 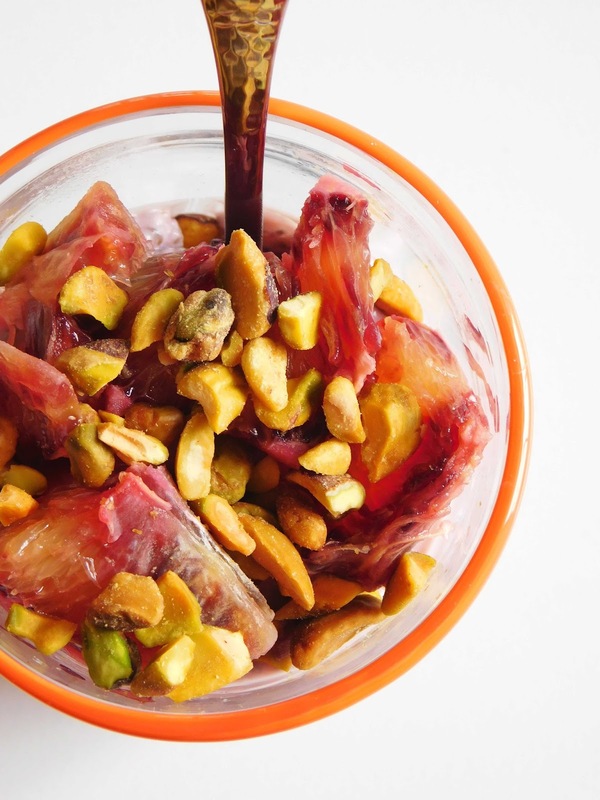 Top with the chopped pistachios and remaining orange segments. Drizzle with more honey if desired and serve. 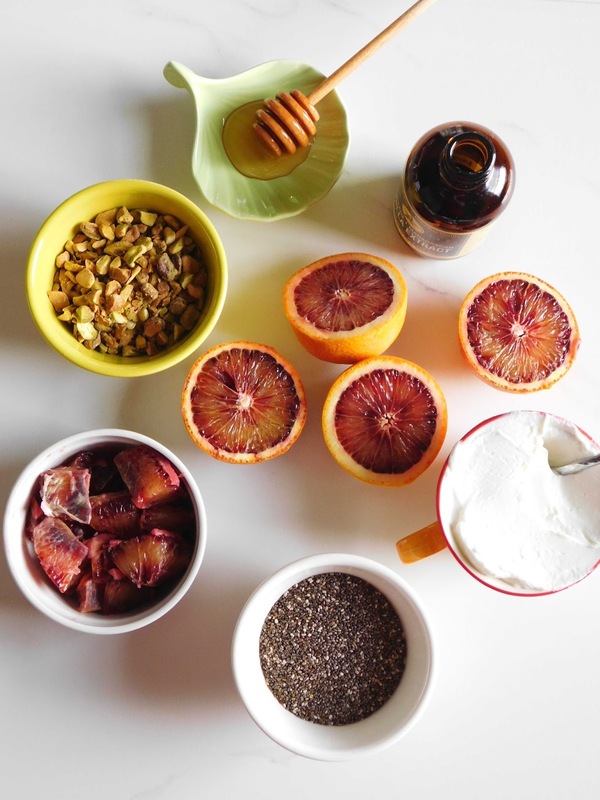 Note: To top the pudding with orange segments, cut the peel and white pith from 2 blood oranges. How to do that: cut a slice off the top and bottom of the orange, making sure you cut just past the pith to expose the fruit underneath. Stand the orange upright on a cut end. Following the curve of the fruit, use a small knife to slice away the peel and pith. Working over a bowl, cut along either side of membranes to release the segments.